There are gazillion benefits if your truckers grasp the importance of regular truck maintenance. Truck driver safety is pertinent to regular truck maintenance, inspection and reporting. FMCSA has been trying to make the processes easier for truck drivers as well as the companies. For example, DVIR mandate helps ease up the process of vehicle inspection and reporting for truck drivers. Driver Vehicle Inspection Report is a federally mandated digital replacement for paper-based truck inspection report for truck drivers. FMCSA requires the commercial drivers to sign off any defects on the DVIR during the pre-trip inspection before taking off for the trip. Although mandatory, a sense of importance of maintenance and reporting lacks throughout fleets. And thus, we need to inculcate the very idea of the importance of truck maintenance in truck drivers and how it contributes to truck driver safety. Enough said, let us dig deep into understanding how we can achieve it. Drivers are most productive when they are engaged. They report to work much more happier than others, and lift up everyone’s spirits. Having a majority of employees attuned to this mindset is most ideal. However, it’s not reflective of the current conditions. According to Gallup’s State of the Global Workplace report 2017, 85% of the employees are not engaged at work. This ‘quite a big number’ certainly has consequences accounting to approximately $7 trillion, as the productivity is lost. Out of 85%, 15% are actively disengaged, while 67% are “not engaged”. This 67% of the workforce is what we target while designing an engagement model. And thus, throughout this article, we shall be talking about this 67%. Who are they, what are they, and how you can inculcate regularity and motivation in them in following maintenance procedures. Josh is a truck driver. He loves to drive and enjoys his job. He is one of the many in the 67% of employee workforce. Now, what more do we know about Josh? He is a regular employee, and delivers his duties responsibly. However, falls back sometimes and needs someone to tell him that he is on the right track, and is doing great. He needs some sort of motivation. It is important to make it easier for drivers to report breakdowns and conduct inspections. The mental barrier around reporting a piece of bad news to the maintenance team needs to be removed. For this, find a way to allow for information flow, with processes that do not stress the driver. Additionally, ensure that the maintenance team receives reports, especially accident reports, real-time and in the right format. This is important - you should ensure that there is no unnecessary back-and-forth with the driver. The easier the process is, the easier the compliance becomes. Quizzes can be fun and engaging, if done the right way. Regular surveys and collection of responses from the employees is important not just for the sake of getting a feedback for your further proceedings and programs, but also because it makes the employees feel important, and connected. The more significant they feel, the more likely they are to listen to you or participate and strive to work better. The first image is that of a simple survey. The second is a quiz. Both, if used well can be used to prop up both motivation levels as well as ego. To report an issue, concern or suggestion - provide drivers with a safe space to report a problem. For this, the team should instantly resolve the issue with one tap or response - Why? The faster the feedback is, the higher the obligation to do well in their job. Now that we understand the objective behind the features, they can be easily leveraged to impart regularity for truck maintenance. 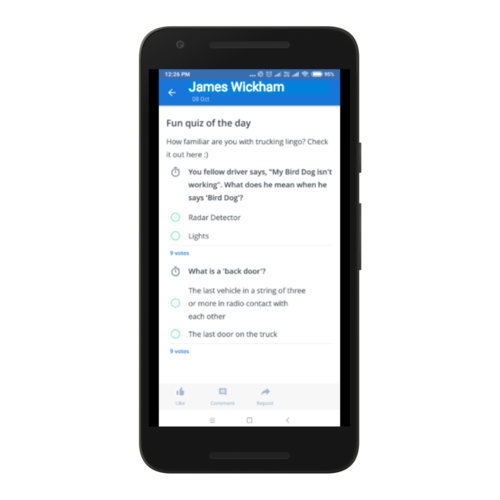 In summary - You can use polls/quizzes on a regular basis to enquire whether drivers have completed their regular maintenance checks. You need to ease the process of logging not-so-pleasant experiences (breakdowns, accidents) and provide a safe space to log their concerns. What we also need to understand is that, a nudge is important for the employees till the time they understand the importance of the job and develop a habit for it. Once the habit is inculcated, you won’t have to keep nudging them regularly. According to a research by Lee Waters in Psychology, gratitude within organizations, is the most accurate predictor of job satisfaction. It is not surprising that a simple ‘thanks’ can drive immense amount of productivity in the biggest organizations across the globe. In fact, as Mike Robbins revealed in his talk at TEDxBellevue, a staggering 64% of recently departed workers as of November 2013 said that ‘no gratitude’ was the main reason they quit their jobs. While incentives is mostly a part of any organizational program now, it is important that it is made public, and shared in a positive light. Set some standards of accomplishment for employees, and reward them on the basis of it, and make sure other employees notice. Simple. NEVER FORGET BIRTHDAYS AND ANNIVERSARIES. Wish them. Just do it. With automation, you can ensure that a birthday celebration never slips out of their minds. While this is not directly related to maintenance, it does indirectly lead to positive perception of the company. If you ever find an employee doing something cool, grab the opportunity and appreciate him/her. It will take a few seconds of your time to convey this, but could mean the world to the employee. People are bound to work better if they get appreciated timely for the extra little efforts that they put into it. With reports that helps them understand their own strengths, weaknesses - you’re clearly giving out the message that you’re watching and the policies needs adhering. Include regular truck maintenance checklist as a part of the performance evaluation criteria, so you can set up the feedback loop. What will the drivers lose by not doing a pre-trip inspection? The answer to questions such as these should come with an incentive/penalty that is relevant to the driver. Communicating this aspect, defining the consequence of not doing something is crucial. Before ruling out any policy be sure to have a management buy in on your incentive structure and have the message come from the top. This will make the vehicular maintenance process mainstay - a win-win for both you and the drivers. Hope you found this article useful. If you’re using other methods to improve driver compliance, truck driver safety and maintenance, do comment below and share the knowledge! The 3 mundane tasks you wished you could stop doing..